At Forwarding Dallas, green roofs and rain gardens will catch the rain, reduce impervious surfaces, cool the climate, create usable open space and possibly grow food crops. Rendering Atelier Data and Moov. … is an approach to designing human settlements and agricultural systems that emulate ecologic relationships from wild nature. It is a land use and community building movement (a cultural ethic, if you will) focused on harmonious and sustainable integration of human dwellings and food production within the broader context of the micro-climatic, hydrological and biological landscape. The practice encompasses the fields of gardening, architecture, horticulture, waste management, community design, energy — even money management. Permaculture endeavors to create stable, efficient productive systems that serve human needs. Work should be minimized and “wastes” become resources, yields increase, and environments are restored. Too often we see that humans live out of balance with their natural systems, leading to environmental degradation, animal and plant habitat loss, species extinction, and extreme weather events. Cities not designed properly for humans, ignoring natural patterns and focused on a limited spectrum of opportunities and constraints, lead to poor mental and physical health and disease. Resource deficiencies and extreme pollution become the norm. Food is shipped in, water piped from faraway reservoirs, while pollution floats into the air, sewage and chemicals drain into rivers and oceans, and trash is carted to a landfill. Think rush hour freeways, nuclear meltdowns, massive flooding. Consider peak oil, global climate change, diminishing fresh water supplies, poisoned oceans, monocrop agriculture producing non-nutritive, pesticide-laden produce. Permaculture Design endeavors to integrate humans with their world, using proven technologies to obtain food, energy, shelter, and infrastructure. Appropriate technologies include solar and wind power, solar greenhouses and cookstoves, sustainably recycled biofuels, energy efficient living and working environments constructed with zero waste non-toxic materials. Perennial cropping systems, such as tree fruits and nuts are blended with annuals within an agroforestry context to increase biodiversity. Ecological methods of production such as soil building, biological pest control, composting, etc, are central to the practice. Farming Systems can include standard organic agricultural practices such as cover crops, green manure, crop rotation, and mulches, but can avail themselves of many other systems that may be more appropriate to the region and situation. Water and soil management techniques include bioswales, graywater, rain catchment, Keyline agriculture, contour planting, hedgerows, windbreaks, and vermiculture composting. Integrated farming systems such as pond-dike aquaculture, aquaponics, spiral herb gardens, intercropping and polyculture are also part of the permaculture ethic. Australian Bill Mollison and his student David Holmgren were early pioneers in the movement, responding to destructive industrial-agricultural practices in Tasmania that poisoned the land and water, reduced biodiversity, and removed topsoil. Mollison observed that plants naturally group themselves in mutually beneficial communities. He used this principle to develop a different approach to sustainable communities and agriculture. Mollison hates lawns and considers us slaves to mowing and watering them; he believes every house should be over-producing its energy and selling it back to the grid and growing their own food. He calls it an anti-political quiet revolution open to all, with the simple ethic of care for reinvestment in the earth and people. See Bill Mollison in this video on suburban permaculture with regards to development in Davis, California. Consider water shortages, impacts to surface water ecology, wetlands, and fisheries from damming and draining water resources and siphoning underground aquifers. Urban sewers are overflowing with a combination of raw sewage and rainwater, polluting streams, lakes, and oceans. Cities are overheated from the heat-island effect of reflecting pavement, impervious surfaces repelling rainwater that drains the dirty streets into the sea. In order to confront this we must implement a series of permaculture practices such as Green Roofs and Rain Gardens to catch the rain, reduce impervious surfaces, cool the climate, create usable open space and possibly grow food crops. Rainwater can soak into the ground instead of flowing into storm drains and surface waters. Rain gardens can improve surface water quality. Homes should catch their rainfall by installing multi-purpose rainwater tanks for personal and landscaping use. Take a look at the project Forwarding Dallas as an example of greening the city through sustainable building design and the proliferation of green roofs and rain gardens. A collaboration between Portuguese-based architectural firms Atelier Data and Moov, it provides a model of sustainability for cities to follow. 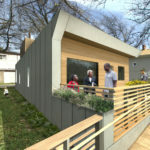 See “Green Development Does Dallas,” from UrbanGardensWeb.com. Urban community gardens should be started on open urban land to increase access to healthy food as well as provide green relief from the urban jungle. Seattle’s P-Patch Program has led to the creation of 75 urban gardens throughout the city. Their volunteer-run community gardens offer 1,900 plots and serves more than 4,400 urban gardeners on 23 acres of land. With a youth gardening program and a 12.3-ton produce donation in 2009, Seattle leads the urban horticulturist movement in the USA. Climate change, global economic instability, overpopulation, erosion of community, declining biodiversity, and resource wars have all stemmed from the proliferation of cheap, non-renewable, polluting fossil fuels. Global oil, gas, and coal production is predicted to irreversibly decline in the next ten to twenty years. Though some may tout a millennium’s worth of hydrocarbons left at current rates of energy use — including methane clathrates from solid ice-gas on the ocean floor — climate change is happening now. Burning methane is the opposite of smart, at this point. ZERI is a global network seeking solutions to world issues using nature’s design principles as inspiration with over fifty projects across the world. Gunter Pauli is the spokesman with his book The Blue Economy which endeavors to present a number of practical, affordable solutions to world problems that mimic ecological processes. Recorded live at TEDxTokyo on May 21st 2011, at the Miraikan, Odaiba. Irno Pretto Farm in Brazil was transformed by introducing the Integrated Farming and Waste Management System (IFWMS) developed by George Chan of the ZERI Foundation (www.zeri.org). Productivity and biodiversity were increased while generating energy, reducing waste and eliminating pollution. National Sustainable Agriculture Information Service, National Center for Appropriate Technologies. David Holmgren was never Bill’s student. Bill was his mentor, different thing.